Welcome to Vegas, the city that never sleeps and it seems you have not been sleeping. You have spent all of your time losing and now it is time to pay up. You have 60 minutes before “the man” comes to collect and the only thing that will save you is a winning hand. Will you be able find the clues and solve the puzzles necessary in 60 minutes to gain that winning hand? Are you willing to take that gamble? Do you have what it takes to escape? Book Now and take on the challenge! This escape room holds up to 10 team members. 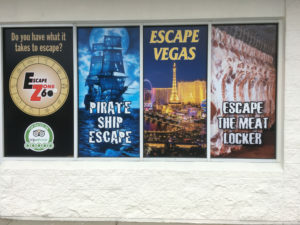 Our Sandestin/Miramar Beach location also offers the Pirate Ship Escape.